1. There are basically two types of camels – the one-humped camel (Dromedary Camel) and the two-humped camel (Bactrian Camel). 2. A camel’s hump is nothing more than a big lump of fat. 3. Camels can go without water and eating for up to four days. 4. Camels can carry about 500 pounds on their backs. 5. 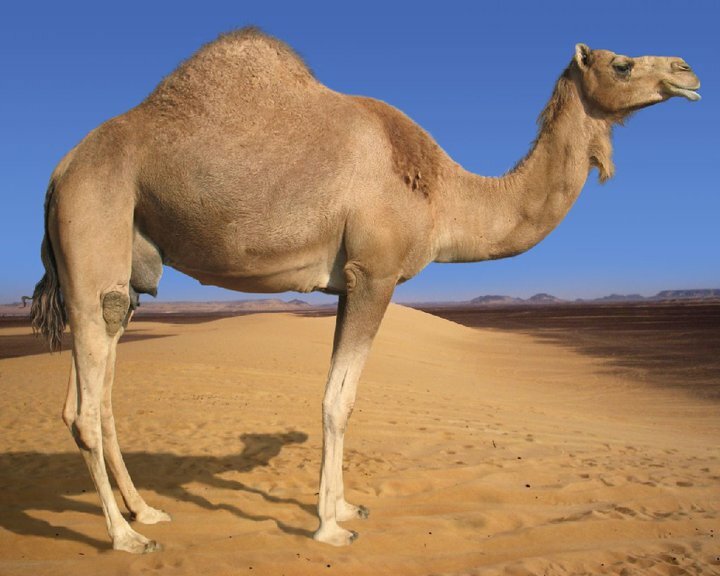 When a camel begins to get dehydrated and they begin using more fat to increase energy, their humps begin to shrink. They begin to grow again when they rehydrate. 6. Camels can drink as much as 30 gallons of water in less than 15 minutes, making them the fastest rehydrating mammals in the world. 7. When camels feel threatened, they will begin spitting. There is usually vomit included in the spit, making this a defense tactic. 8. Camels are built to live in the desert. They have two rows of eyelashes and three eyelids to help keep the sand from getting into their eyes. 9. Depending on the availability of food, a camel’s gestation period can range anywhere between 9 and 14 months. 10. Camels have one offspring, or calf, at a time. The calf can start running within just a few hours of being born. 11. Camel’s milk is healthier than cow’s milk because it has more vitamins, iron, and minerals and less fat. 12. The life expectancy for camels is between 40 and 50 years. 13. A camel can endure losing up to 25% of its water weight from sweating before heart failure begins to set in. Compare that to most other mammals that can only lose 15% before they start feeling negative side effects. 14. The camel is the only land mammal that has oval-shaped red blood cells. All other land mammals have round red blood cells. 15. A camel’s urine is as thick as syrup and its feces is dry enough t be used for fuel. 16. Camels generally lie down in order to sleep or rest. 17. The fur on a camel helps keep the animal insulated in the desert heat and it also reflects the sunlight away to help keep it cool. 18. There are an estimated 17 million camels in existence in the world today. 19. From the ground to the top of their hump, camels can measure up to 7 feet tall. 20. Camels have two toes on each foot and a leather-like pad on the bottom which helps prevent it from sinking in the sand when walking through the desert. 21. Although a camel’s ears are relatively small, they have a strong sense of hearing. 22. The two humps on a Bactrian camel weigh about 75 pounds each. 23. Dromedary camels are generally found in Africa and the Arabian Peninsula. The Bactrian camels are found in Asia, mostly in the Gobi Desert. 24. Riding camels can travel between 80 and 120 miles per day. 25. Camels prefer to walk, but they can also gallop when it is needed. They also have a speed between a walk and a gallop, called a pace.